This is one of the most unique examples of photographic serendipity I have collected in my personal portfolio, and I still can’t believe it actually worked out. 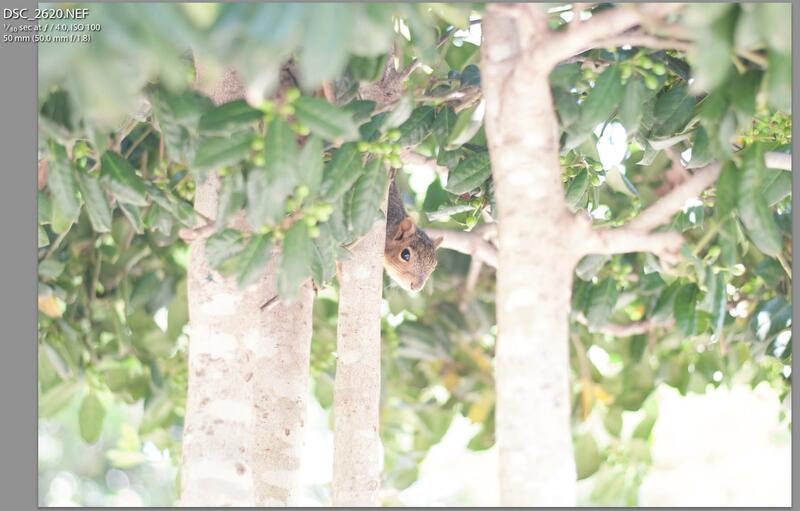 I was out shooting a few pics for a Digital Photography School article on using the Program Automatic mode on a DSLR camera when I came across this skittish squirrel running up and down a few small trees. I watched him dash up this young magnolia tree, seeking sanctuary from a pair of furious mockingbirds nearby, and waited a few minutes to see if he would come back down. 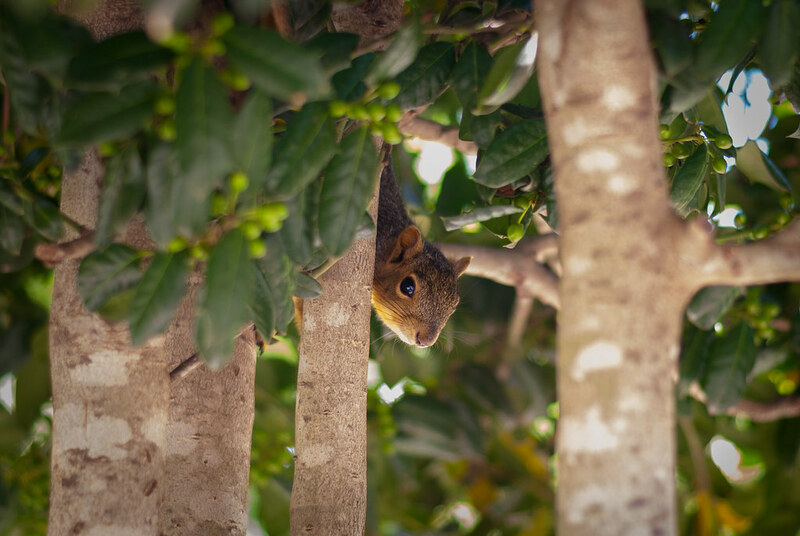 A bit later I saw him poking his head out of the tree canopy so I raised my camera, focused, waited a bit more until he crawled a few more inches down to have a look around…and quickly fired off one single photo. I don’t know if it was the sound of the shutter or a sense that the mockingbirds were not going to leave him alone, but he immediately dashed down and ran off to another tree close by. And the histogram. Double ouch. A while later I came back to the photo and figured I might as well give it a shot and see what could be done. Much to my surprise there was enough color data captured in the RAW file to do quite a bit. Lowering the exposure 2.5 stops, dropping the highlights, and a few other edits later (as well as some tweaking with the adjustment brush) resulted in a photo that was not only quite usable, but not that bad overall. The most important takeaway from this is one I keep coming back to: shoot in RAW! Storage space is cheap, and you never know when all that extra data might come in handy. Incidentally this was a 12-bit (not 14-bit) RAW file, and I know there’s a lot of debate over which one is better, but seriously…if I can salvage this much from a 12-bit RAW file (taken with a 10-year-old, 10-megapixel Nikon D200) I don’t see any reason to shoot in 14-bit. Nice that you were able to work with the color settings like that, Simon. 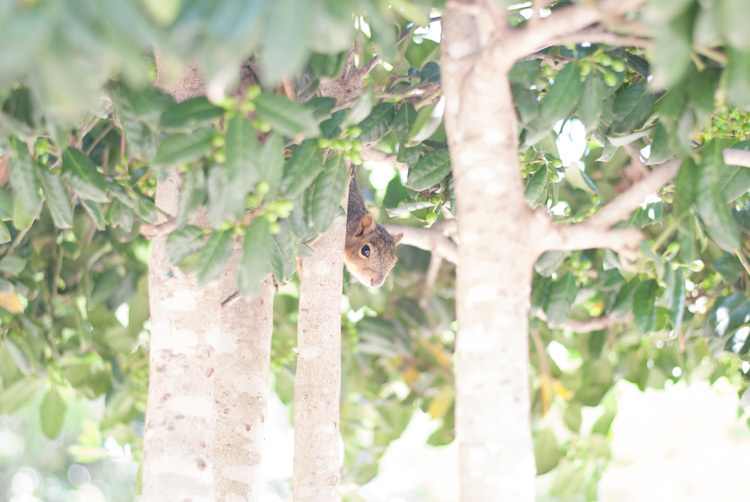 Cute little tree rat, too! We’ve now got an entire horde of black squirrels who have infiltrated the park. The first one came in here by truck from Marysville, Kansas, home the black squirrel, where it is a $100 fine if a motorist hits one. They migrated from 68th and Ballard down to the park on 63rd street, and now they’ve overrun the brown squirrels. I think these black squirrels are very unique, because they sure know how to Rap!!! Thank you! This was very encouraging. I don’t use Lightroom – yet – but I have save a few photos in Picasa. I just need to remember this option is there instead of just sending them to the trash. Linda, if you shoot in RAW you’ll have much more room to edit your pics if they don’t turn out how you want. Even if you just use Picasa, you’ll still be able to do a lot more editing than if you use JPG. Of course the downside is RAW files are huge! Almost 20 megs per file, or more depending on the camera you have. Good shot of the squirrel. I guess the good news about the problem with your aperture closing system is that it opened up giving you some nice bokeh in this picture. This is further evidence that we should be shooting in raw. 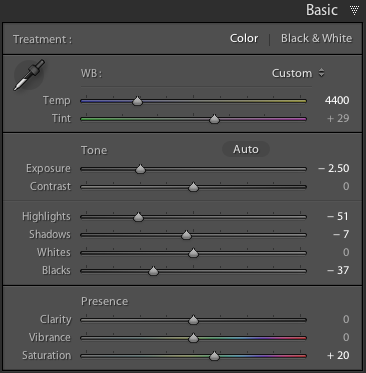 What is your opinion of Lightroom v. Photoshop? I have not yet got into photo processing and I am trying to figure out the best approach. As usual, thank you for taking the time to keep this site going. Lightroom and Photoshop are both great programs, and I use them both but for different purposes. Most of my editing is done in LR, but I fire up PS if I need to do some heavy alterations or other edits like warping or layer masking that aren’t really possible in LR. I’d say out of 100 photos I take, 99.5 are edited in LR and every now and then I use PS. It just fits my workflow better, but I know a lot of photographers who do more with PS and very little in LR. Reminds me of an image I took this week. I had gone outside to photograph flowers in soft evening light. The dogs, as always followed me. I wasn’t getting close enough to the flowers, so I went inside for some magnifying filters. Luckily they were not on the lens yet. As I headed back out the door, there was this fellow, right where I had been sitting. Of course my fierce garden protector is clueless. Oh wow, Rebecca, that’s really cool! I like how the chipmunk is looking to the side, and the dog is looking the opposite direction. It almost seems like the two are kind of staring each other down :) Way to go on snapping this picture! It’s fun unplanned pics like this that I tend to enjoy the most. Keep up the good work!